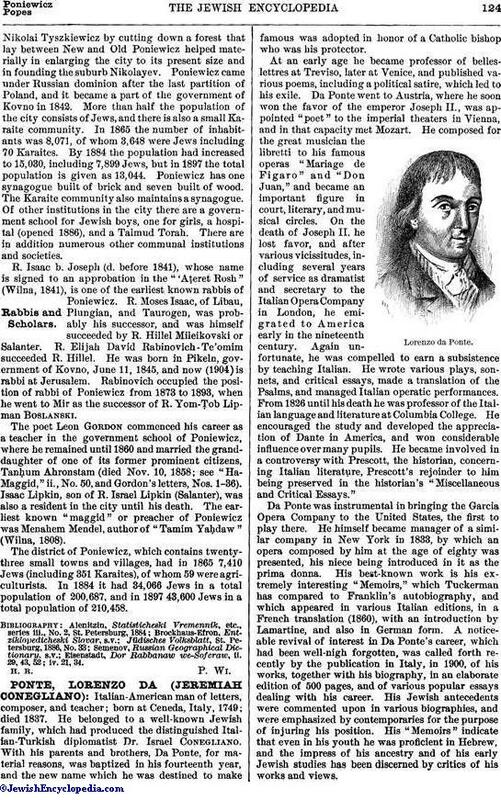 Italian-American man of letters, composer, and teacher; born at Ceneda, Italy, 1749; died 1837. He belonged to a well-known Jewish family, which had produced the distinguished Italian-Turkish diplomatist Dr. Israel Conegliano. With his parents and brothers, Da Ponte, for material reasons, was baptized in his fourteenth year, and the new name which he was destined to make famous was adopted in honor of a Catholic bishop who was his protector. At an early age he became professor of belles-lettres at Treviso, later at Venice, and published various poems, including a political satire, which led to his exile. Da Ponte went to Austria, where he soon won the favor of the emperor Joseph II., was appointed "poet" to the imperial theaters in Vienna, and in that capacity met Mozart. He composed for the great musician the libretti to his famous operas "Mariage de Figaro" and "Don Juan," and became an important figure in court, literary, and musical circles. On the death of Joseph II. he lost favor, and after various vicissitudes, including several years of service as dramatist and secretary to the Italian Opera Company in London, he emigrated to America early in the nineteenth century. Again unfortunate, he was compelled to earn a subsistence by teaching Italian. He wrote various plays, sonnets, and critical essays, made a translation of the Psalms, and managed Italian operatic performances. From 1826 until his death he was professor of the Italian language and literature at Columbia College. He encouraged the study and developed the appreciation of Dante in America, and won considerable influence over many pupils. He became involved in a controversy with Prescott, the historian, concerning Italian literature, Prescott's rejoinder to him being preserved in the historian's "Miscellaneous and Critical Essays." Da Ponte was instrumental in bringing the Garcia Opera Company to the United States, the first to play there. He himself became manager of a similar company in New York in 1833, by which an opera composed by him at the age of eighty was presented, his niece being introduced in it as the prima donna. His best-known work is his extremely interesting "Memoirs," which Tuckerman has compared to Franklin's autobiography, and which appeared in various Italian editions, in a French translation (1860), with an introduction by Lamartine, and also in German form. A noticeable revival of interest in Da Ponte's career, which had been well-nigh forgotten, was called forth recently by the publication in Italy, in 1900, of his works, together with his biography, in an elaborate edition of 500 pages, and of various popular essays dealing with his career. His Jewish antecedents were commented upon in various biographies, and were emphasized by contemporaries for the purpose of injuring his position. 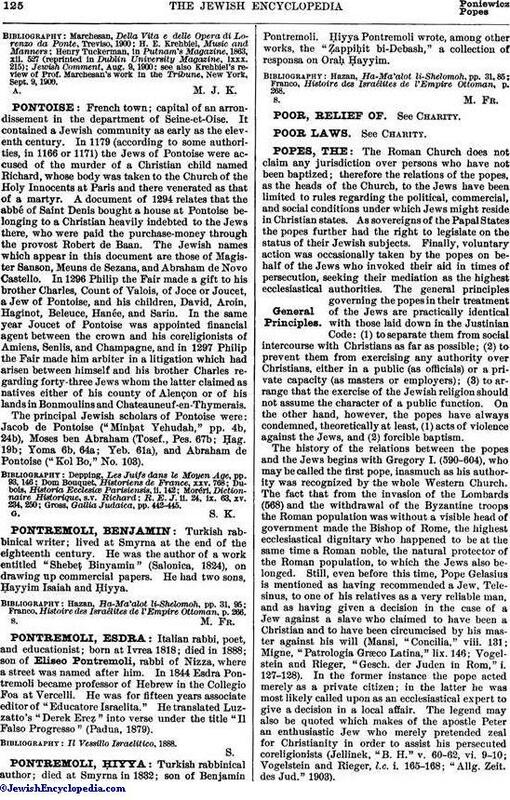 His "Memoirs" indicate that even in his youth he was proficient in Hebrew, and the impress of his ancestry and of his early Jewish studies has been discerned by critics of his works and views. see also Krehbiel's review of Prof. Marchesan's work in the Tribune, New York, Sept. 9, 1900.